You should start with just a few pricks and if the skin heals well, increase it. There is no precise number of pricks known to be absolutely ideal; you have to improvise a little. Our instructions say to stamp each scar eight times with a dermastamp. Around 280 pricks per cm² (our dermastamp has 35 needles). If the skin heals well, you can do more pricks into one scar but do not very much overdo it because theoretically you could end up with a scar. Do not incorporate single needling but surely incorporate the suctioning. Rolling scars will likely not improve much without solving the tethering problem by suctioning. The tethering strands are the main reason of the indentation of acne rolling scars. There are several suggestions in the suction thread how to improvise it. You also have to read the study itself. Dermarolling / Microneedling / Dermarolling over spider veins? The best reply I can give is that from our own experience and the feedback from our customers, the spider veins did not improve and did not worsen. I have been using vit. C serum for two years and I am quite often outside, hiking in the sunny outdoors and I have never gotten any spots but not everybody reacts the same so remove vit. C from your routine to test it. Another possibility is that your skin overreacts to the needles by producing more skin pigment in the areas where the needles entered the skin but such oversensitivity is extremely rare. You can get pigmentations from dermarolling if you expose your skin to the sun immediately after dermarolling. Stamping once every 4-5 weeks with a 2 mm dermastamp is a proper stamping frequency. Dermarolling / Microneedling / NEWBIE to Needling. Need help with what to use! If your stretch marks are wide then yes. If they are rather narrow, the single needle would be more suitable. Ideally, buy both because you have stretch marks on many areas and you will certainly find use for both. Apply Tretonoin every third day. Apply Infadolan at least until the skin is healed or as long as the skin is still dry. Dermarolling has often a positive effect on excessively oily skin in acne so you may be lucky. Perhaps you should start with a 0.5 mm regular dermaroller. It speeds up the turnover of the skin and that could reduce oiliness and congestion of pores. Do not expect that your enlarged pores will shrink in size though. Pores are not scars; they are deep ducts in the skin. The overall skin texture often improves with dermarolling but significant and permanent reduction of pore size is currently not possible by any method. Only a few of our customers managed to reduce their pores with dermarolling/needling. A great many customers managed to considerably reduce their acne scars and various other scars. 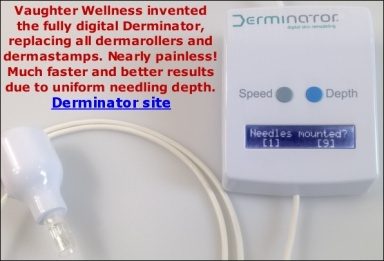 Dermarolling is often advertised for improving spider veins but we do not claim on our website it improves spider veins because in our experience it neither improved nor worsened spider veins or telangiectasias. None of our customers reported improvement or worsening in that field after dermarolling. Nevertheless, there may be customers who achieved improvement and did not report it so it would be interesting if you could give us feedback. So far I have not been recommending dermarolling for improving spider veins because my own experience and the feedback from our customers does not justify such recommendation. If any of you experienced any improvement, please let us know. Well, the skin is probably fully healed the next morning but it is better to use a sunscreen on your face in any case. Sunshine is the main culprit in skin aging. I think your stretch marks are quite mild. I certainly have seen much worse. If you have time, use a 1.5 mm regular dermaroller + the single needles (laborious but very effective). If you do not have much time, use a 1.5 mm regular dermaroller and a 1.5 mm ONE LINER dermaroller. On your arms, do not use the single needles, just roll it with the 1.5 mm roller because the skin on the arms is often much thinner than elsewhere and some of our customers got bruises while needling the arms. Wait at least one week after rolling. Do not use any peels if you still have scabs from needling. Dermarolling / Microneedling / Recent treatment left depressed scars- would needling help? Yes, I think there is good chance needling will help. Buy a 1.5 mm dermastamp and stamp your scars every three weeks. Let us know whether it helped. It will take several months to see results so be patient. I had to laugh when I read all the hype about the "Veinwave", especially about their claims that it is a completely new, modern, innovative, magical way of treating dilated veins. The Veinwave (a misnomer) is based on ordinary thermocoagulation, which is a method that has been known for centuries and it has been used to zap spider veins already for decades. It is nothing new. A small needle is inserted into the skin, very near or into the vein, and then a current is passed through for less than a second. This current is absorbed by the surrounding tissue, heating it up. The high temperature seals the walls of the dilated vein. The whole vein is zapped spot by spot. We've investigated exactly how Veinwave works and that wasn't easy - they have put up a wall of nonsense to mask the actual operating principle. They use pseudo-scientific terms such as "monopolar energy" where they mean good old DC current. They also fence with terms like "radiofrequent waves" and "microwaves". Their device doesn't work like that at all. This is their FDA submission for clinical trials, where they use a lot of nonsense-words but it becomes clear how it really works: A needle passes DC current with a frequency of 4 MHz through the skin. A high frequency current is used so that they can fool people into believing their fancy sales mumbo-jumbo about "radiofrequent waves", pretending it's a very special machine so you should pay a lot for the treatment. This same principle has been used for over 100 years to permanently remove unwanted hairs. The needle is inserted into the hair follicle and the hair bulb+germ cells are destroyed by heat. Thermolysis/Electrolysis has been so far the most effective way of permanent hair removal but it is very laborious and slow. Lasers, in spite of their "magical" reputation are much less efficient to treat dilated veins or unwanted hairs because the treatment is not as targeted and it cannot be set up too high because it is prone to cause collateral damage to the skin. Lasers also heat up the skin. The tissue absorbs light from the laser and that heats it up. Everything in the skin absorbs laser light but some parts (for example dark colored parts) absorb it better, especially if specific wavelengths of light are used. Thus you can target hemoglobin in blood and destroy (seal) spider veins by heat. With laser epilation, you target melanin in the hairs and the heat will temporarily weaken the hair bulb. You can target tattoo pigment etc. You can stimulate collagen production by slightly heating up the skin or use more energy and evaporate a layer of skin or just fractions of skin (Fraxel). The problem is that even if you target a specific part of the skin, the other parts heat up as well and in some unfortunate cases, the heat destroys for example melanocytes (pigment producing cells) as a collateral damage and you end up with hypopigmented spots or with scars and hyperpigmentation when too much heat was used or the skin overreacted to heat. To show you how fine the line is between positive and disastrous results, there were cases with laser epilation, where the treatment actually stimulated the growth of thicker and coarser hairs in the area above the lip because to avoid potential burning of this sensitive area, the epilation laser was set too low and instead of paralyzing the hair bulbs with intensive heat, the bulbs were just slightly heated which actually stimulates their growth.. The skin itself also contains melanin (the darker the skin the more melanin it contains) and setting the epilation laser too high can burn the skin. Using enough energy to destroy or stimulate certain targets but not too much in order not to burn the (surrounding) skin is very difficult and what works for one person can be too much or not enough for the other. Incidentally, needling or dermarolling cannot help with an indentation after IPL or laser treatment if it is caused by receded (destroyed) fat. It can only improve an indentation caused by damaged skin. Obviously, targeted treatments such as thermolysis or thermocoagulation are more effective but they are also very intensive and in some unfortunate cases or with improper settings, they can burn the skin and leave scars or pigmentations.